What if you really want to live abundantly before it's too late? What do you do if you really want to know abundant wholeness? This is the one begging question that’s behind every single aspect of our lives --- and one that The Broken Way -- rises up to explore in the most unexpected ways. This one's for the lovers and the sufferers. For those whose hopes and dreams and love grew so large it broke their willing hearts. This one's for the busted ones who are ready to bust free, the ones ready to break molds, break chains, break measuring sticks, and break all this bad brokenness with an unlikely good brokenness. You could be one of the Beloved who is broken --- and still lets yourself be loved. Ann Voskamp is wife of one good farmer, Darryl, the home-educating mama to a half-dozen exuberant kids, and author of the New York Times Bestseller, The Greatest Gift, and One Thousand Gifts: A Dare to Live Fully Right Where You Are, a New York Times 60 week bestseller that has sold more than one million copies, the royalties of which the Voskamp family has given all away, the joy always in giving the gift back. 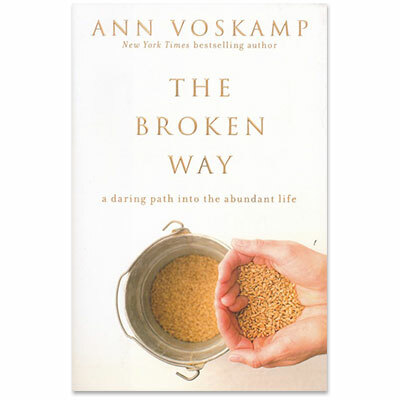 Named by Christianity Today as one of 50 women most shaping culture and the church today, and a partner with Compassion International as a global advocate for needy children, Ann's a regular loser of library books, usually has a sink full of soaking pots, sees empty laundry baskets rarer than a blue moon, and believes that the sky and fresh mercy over the farm is large and all is grace. Her blog, one of the Top 10 Christian blogs on the web, has become a daily well for the weary and soul-thirsty: www.aholyexperience.com.